ACTION ALERT! 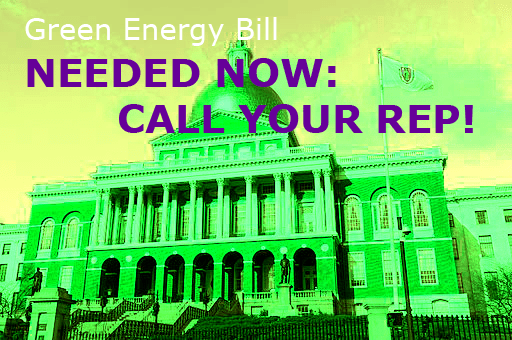 Negotiations are still under way in the state house for the green energy bill. We need to keep up the pressure right now. Calls are better than emails, but emails are better than nothing. CALL SCRIPT you can use, distribute, or adapt to your own needs; details on the bill in the comments. 1) Increase the RPS to 2%- this is crucial to assuring we will meet our emission reduction goals. 2) I oppose the “pipeline tax,” and urge you to protect ratepayers and our environment by prohibiting subsidies for new gas pipelines, as the Senate has done. 3) I support procurement of 2000 megawatts of offshore wind. I am pleased both chambers have chosen to support offshore wind, and want to see a bigger commitment! 4) I support decommissioning planning and financing for Pilgrim Nuclear Power Plant. Please contact Speaker DeLeo and the conferees to ask them to include these policies in the final bill. It outright BANS the Department of Public Utilities from charging electric customers for gas pipelines. It provides for the decommissioning of the Pilgrim nuclear power plant. We need these provisions. They are essential to securing the clean energy future for which we have been fighting for so long. The House and Senate have named Senator Ben Downing, Senator Marc Pacheco, Senator Bruce Tarr, Representative Brian Dempsey, Representative Tom Golden and Representative Brad Jones to a conference committee which will negotiate the two bills. Please call your representative and ask him/her to speak to Speaker Deleo and the conferees about standing up for these priorities This is their last chance to push their leadership and stand up for what they believe in. As I said, we are so close to something truly historic. But we need every last bit of effort we can muster to win. Now is the time to stand up and make your voice heard. Please join us in doing so!